Guns N’ Roses are streaming a video recap of their summer run of North American stadiums. 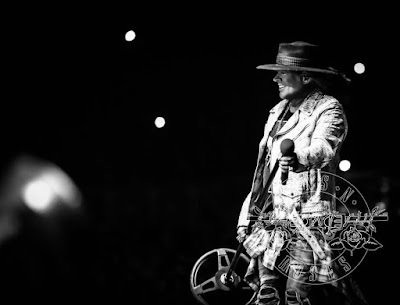 The trek – which opened in St. Louis, MO on July 27 – saw the reunited trio of Axl Rose, Slash and Duff McKagan perform 15 dates before more than 535,000 fans to earn revenue of $53 million. According to a mid-year report by Pollstar, Guns N’ Roses had the highest-grossing worldwide tour in 2017, with an industry-leading $151.5 million gross from January 1 to June 30. A 19-date summer European leg of the “Not In This Lifetime” tour recently added $112 million in ticket revenue to expand the total take from the extended global trek to more than $300 million in 2017 and over $400 million since its launch in April 2016. Guns N’ Roses are currently playing shows on a fall North American leg that will wrap up at The Forum in Los Angeles, CA on November 29.